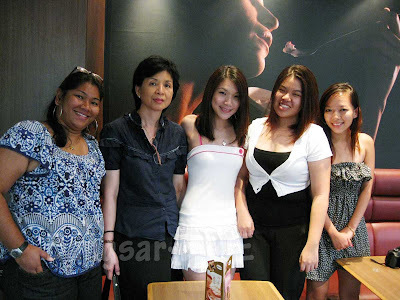 Sabina from Pat-Lin Communications invited my mum and I to try the new Cappuccino Truffle from Häagen-Dazs, 1 Utama last Saturday in conjunction with Mother’s Day. Häagen-Dazs recently celebrated its 15th Anniversary, and the Cappuccino Truffle is a new flavour introduced as a kick-off celebration. 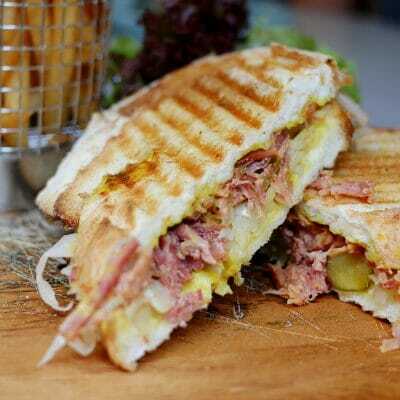 We were free to select any of the seven tantalising creations (woot! 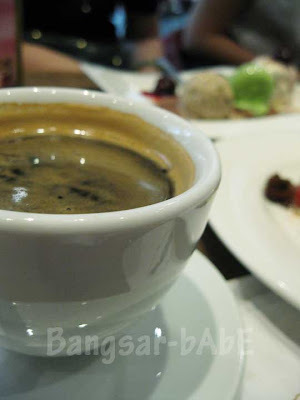 ), and on top of that, we enjoyed a free flow of ice cream, coffee and tea. Double Woot!! 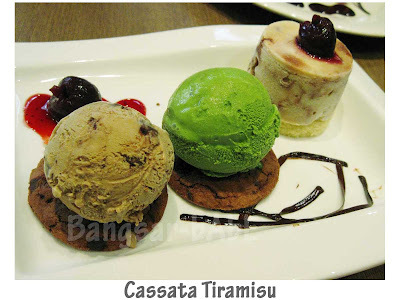 Mum went for the Cassata Tiramisu, which was Tiramisu ice-cream cake served with a scoop of Cappucino Truffle and Classic Vanilla, and luscious black cherries. She exchanged the Classic Vanilla with her favourite Green Tea. Mum had a few spoonfuls of her dessert, and I greedily polished the rest. 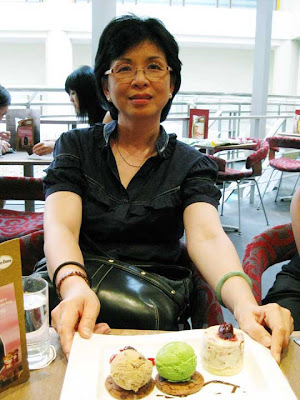 While my mum enjoyed the ice cream, she is also very health conscious and tries not to eat too much sugary snacks. 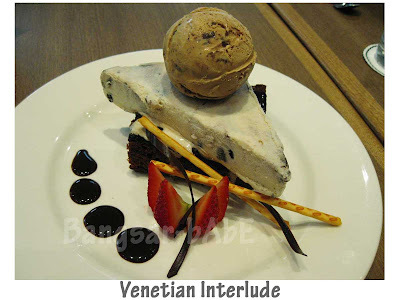 o_0 I had the Venetian Interlude. The rich, chocolaty brownie came topped with a generous serve of Cookies & Cream and a scoop of Cappuccino Truffle. The Cappuccino Truffle was a delicious combination of creamy coffee ice cream and decadent chocolate truffles. I enjoyed every spoonful of this! 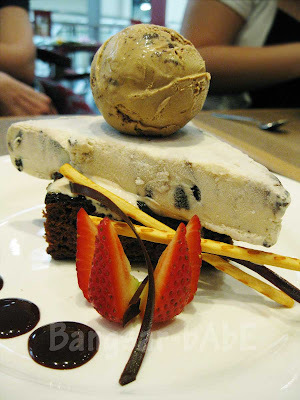 Cookies & Cream has always been my favourite, so this brownie ice cream combo was heaven on a plate! 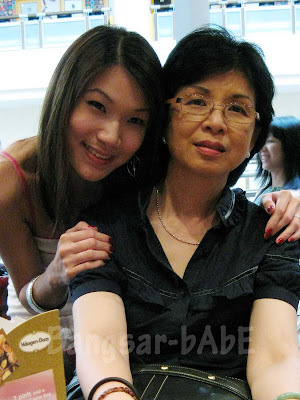 It was nice meeting Wei Zhi from KampungboyCitygal, and my mum and her got along very well. Me getting a free cake from the lucky draw was the perfect end to a lovely afternoon! Thanks Sabina and Regina, for the invite! Hey there… glad you had fun… will keep you posted when the next flavour comes out! pity, i was in HK when they told me abt this..
leo – Don’t forget to try this new flavour! 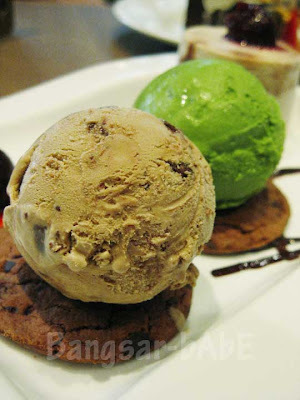 Bangsar-bAbE + ice cream = BLISS!! 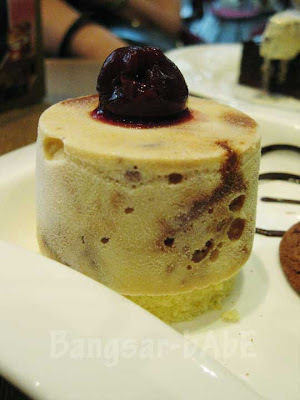 The Capuccino Truffle from Haagen Dazs was a disappointment, personally for me. The coffee flavour was too overpowering, to the point that I could hardly taste the chocolate 'truffles'. Their previous limited edition, the Hazelnut flavour was so much better. 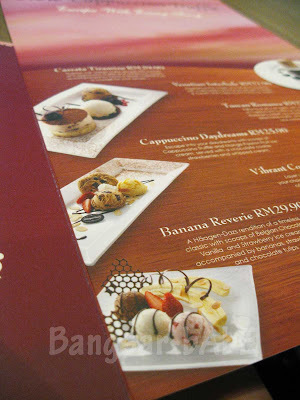 I'm not sure, but the range of Haagen Daz's flavours available in Malaysia is a massive diappointment. For example, whatever happened to Brandied Cherry ? The flavours available is always the usual suspects. For real natural flavored, creamy ice-cream, nothing beats Ben & Jerry's in my opinion. I have to turn to their Cherry Garcia now to get my fix of Cherry ice-cream. 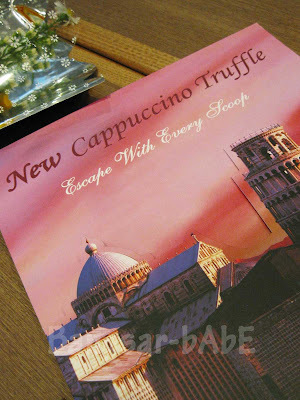 I rather enjoyed the Cappuccino Truffles, probably because I love the strong coffee flavour in it. In fact, most ice creams with a strong undertone of coffee would win me over. but out of topic, how u manage to stay so slim with all the burgers, chocs and ice cream?! Take a look at the link below for the full list of Haagen Dazs' flavors, then you'll have an idea about how the local Haagen Dazs' distributor has short changed us! As for Ben & Jerry's, unfortunately, you can only buy them in pints from supermarkets like Mercato's, Cold Storage, Giant (selected), etc. B&J's specialise in ice-cream with chunks and bits in them. I think all of their ice-cream has bits of stuff in 'em. Its a personal matter of preference, though. But I do find their flavor's more 'natural' and subtle compared to Haagen Dazs. But Haagen makes better tasting chocolate ice-cream though. DF – I like B&J chocolate chip cookie dough, but that's just one of the very few flavours I've tried. And it's much cheaper to get it overseas, so I never bought any in KL. SimpleGirl – The gathering was nice…and with lots of ice cream! Hey BBabe, drop me an email at Juliansi at Gmail dot Com if you wanna attend Thursday's HAAGEN-DAZ event 🙂 Cheers! ps – They sent me an invite, and alas I am not in the country!